This comforter and sheet set is absolutely adorable! I constantly get asked "where did you get that!" My 3 year old picked it out himself, who is obsessed with construction sites. I'm so glad I was able to find bedding that matched his interests! The quality is great also. Bring their imaginations to life with whimsical bedding collections by Waverly Kids. 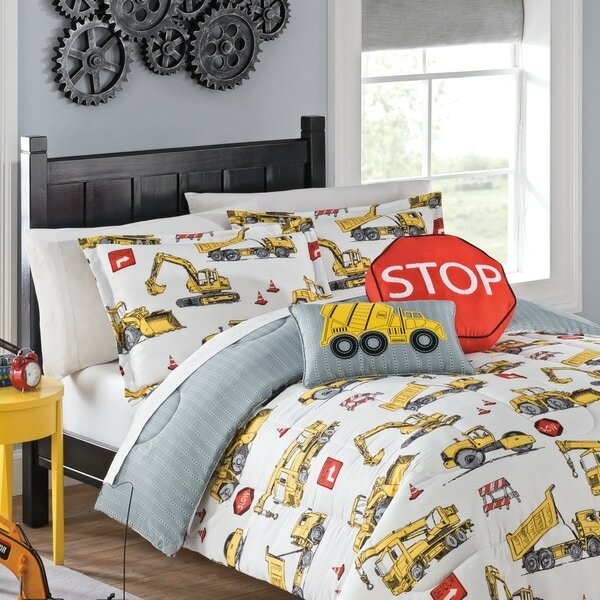 This adorable collection features an allover construction theme with truck and sign motifs. Reverse features white and grey stripe print. Nice comforter. Great colors. Good quality. Would recommend for your little construction enthusiast. My grandson loves it!! Also, has pillow accessories that match perfectly. Good buy. The design is cute- my preschooler really loves it. The quality leaves something to be desired. It’s thin and I don’t imagine this lasting very long. The pillow sham just snagged when I picked it up and it’s been sitting in a rocking chair unused for the 6 days total that we’ve owned this. I expected more for the price- would’ve been better off purchasing something similar from a box store for half price. The comforter is perfect for my sons new room! I’ve been searching everywhere for this in a full size and Overstock came through! The comforter is very soft, fits a full size bed well and has a great print on it. I’m very satisfied with my purchase! My son has had this for months now, after many washes it is still in good condition. The material is soft ! I plan to order another shortly for a bunk bed! Great quality fabric! He loves it! Perfect for my grandson as he moves into a big bed.